Sometimes it’s easy to take for granted how lucky we are. For example, I live in relatively safe environment (we’ll ignore the standards of driving on the M27 for a moment) and I can afford to eat a varied and nutritious diet that includes the odd treat. Plus I get to go home to a warm house at the end of the day. I don’t get to see many of the bad situations that people around the world are in because I don’t read the papers of watch the news. So, it often takes seeing someone huddling in a sleeping bag on a cold pavement asking for loose to remind me how lucky I am. 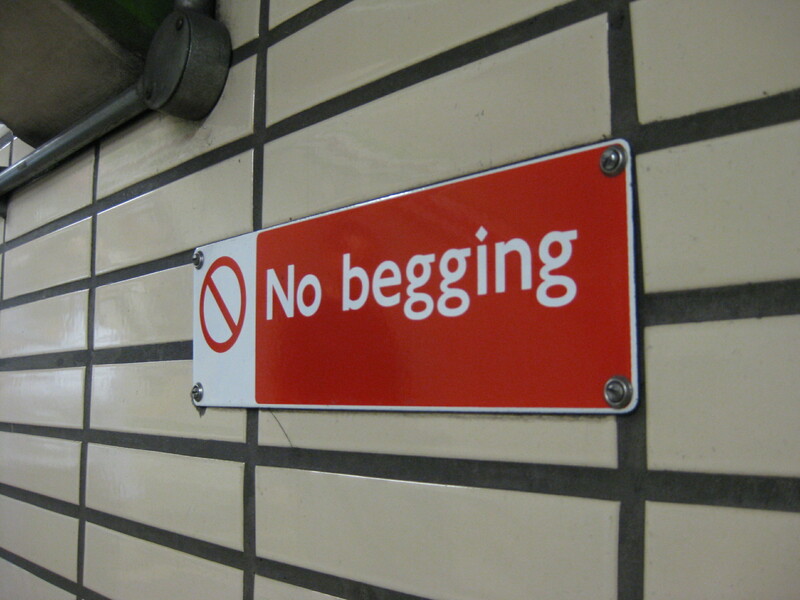 Unlike some people, I’ve never been one to get chatting to people who beg. I’ve certainly never given them any money. I always felt a bit guilty about this, especially if I encounter them next to the cashpoint as I take out a few notes to spend on an evening out. The guilt is particularly strong this time of year with Christmas on the horizon. However, it turns out that I’ve been doing the right thing all along – sort of. This is because many people who beg do so because they need cash for drugs or alcohol. For instance, a survey by the Southampton-based charity Society of St James found that 75% of street beggars used the cash they received for drugs and alcohol. There’s also evidence that not all beggars are homeless as we might assume. Councils in Southampton and Winchester say that some so called “professional” beggars in these cities do have somewhere to live. This had led Southampton City Council to propose the introduction of Public Spaces Protection Orders (PSPOs) in certain parts of the city. This would give police – or even private security firms – the power to prosecute people for activities that aren’t even crimes in areas where PSPOs don’t exist. Not good news for people who are genuinely in need of help. If we do give money to beggars, there’s a high chance that they wouldn’t spend it on food or shelter. So what can you do to help beggars, without giving them cash? The best option is to donate money to a charity that helps homeless and disadvantaged people. They can then use the money you donate to support people who need it. For example, by helping them with drug or alcohol issues or by providing them with clothing, food and shelter. Donating to food banks is another option – this can help people who use the money they get from begging to feed themselves. Just because you’re not giving a beggar money it doesn’t mean that you can’t buy them something instead. A hot drink, a bottle of water or some food are good options. If they’re currently sleeping rough, they might also appreciate some warm clothing or toiletries. Many people on the streets know that help is available. But they may not know how or where to access it. If you’re concerned about someone who may be sleeping rough, you can contact StreetLink. This UK-wide charity will then work with the local authority to put the person in touch with the relevant support services. You don’t have to speak to the person you’re worried about if you don’t want to. Do you give cash to people who beg? In what ways do you help them? Do you think we should we help them at all? A little non understanding of the differences of ‘RoughSleeping’, and the abused ‘Homeless’ word, & the integrity of charities that live on our back. We don’t beg. We are in the libraries. There is no help available. “This UK-wide charity will then work with the local authority to put the person in touch with the relevant support services.”. = Tick the box, take your cut, and pass the buck to someone else = argumentum ad nauseam, or argumentum ad infinitum after it goes full circle. I think that you would benefit greatly from reading my posts on this subject. I could re post it here, but there is enough repetition already. Just click on the icon. At Xmas, when giving food, please put it in the polystyrene takeaway boxes, then re microwave it, so that it stays piping hot while we eat it. Nothing worse than freezing food, done as a flat artistic pattern, on a freezing flat plate, in the freezing wind, at Xmas. When it is cold, we want food that burns our mouths. Thanks for your comment and perspective on this. Where do you post about this? Feel free to add the link. You could have clicked on my avatar, and been led to extra links, or the link in the above post, and been led to extra links. There are some links here. Problem is that I post on most UK Newspapers on this subject, and some don’t list all your posts when you click on the avatar. So, I am working on a solution to this. In the new year, I will gather all the postings from all the papers, and sites, and put them in a folder, with the photos. This will have the advantage of also showing postings that have been censored out, at the requests of some ‘charities’. The photos, that are presently too small to be immersive in our world, should be re hashed by Xmas, so that they are considerably: more numerous, bigger, more immersive. Thank you for your comment as a proper ‘Rough Sleeper’. Too many people do not know the difference! As human being we have some responsibility, why only NGOs will do. why we not create something which helps NGOs work. Giving the money to charity or beggars is not a solution, Beggars have their gang and in the gang the children are trapped or kidnapped,drugs addiction etc. I give to beggars. Its not my place to judge why they beg or what they will do with the money – they are needy and I help the needy as often as I can whenever I have whether with money, clothing or food. These people (for the most part) are not ignorant, they know that they have descended below all human decency BUT its my place to psycho-analyze or judge. They thank me and the Lord blesses me day by day – in times in my life when I’ve worried about finances or had difficulty: I called upon the Lord, saying: When thou wast an hungered, gave I not thee meat: when thou was thirsty, I gave thee drink: when thou was a stranger, I took thee in; naked, I clothed thee; when sick I visited thee and when in prison I came unto thee. Where now is my blessing o Lord; he always answers and He is always faithful. When you don’t give the beggar (while having); what is your reason, I wonder? Do you say no: I don’t give money to beggars and drive off; or do you say I don’t have (while having) – either way your lie or selfishness will eventual erode your conscious and desensitize you to helping the less fortunate ever. This is the end result of ‘not giving to beggars’ it leads to not giving at all and such a person will ultimately revile the poor and as the scriptures say: “grind the face of the poor”. Great thought. Spread your word at My Selfless Act.